Today we get to know Jana Hollingsworth, a long-time subscriber to Seattle Opera and one of the supernumeraries in our current production of Fidelio. 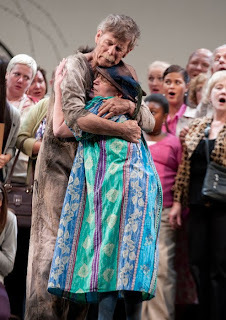 (Left, Jana embraces supernumerary Patrick Gerrells in the final scene of Fidelio, photo by Elise Bakketun.) 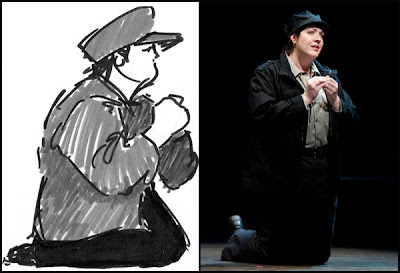 A huge fan of opera, Jana is also an artist, who can frequently be found sketching rehearsals of the Seattle Gilbert and Sullivan Society, as well as at Seattle Opera events. Below, we learn more about her fascinating background, and take a look at some of her sketches. What made you want to be a super in this production of Fidelio? Do you have a favorite moment in this opera? The opportunity arose, and what opera fan wouldn’t want a chance to be a part of the action? Also, I saw this production of Fidelio when Seattle Opera did it before, and one of the problems with being in a show is that one doesn’t get to see the show. Since I’ve seen this production before, that’s not as big an issue. I’ve seen Fidelio twice before, both productions set in modern times, and it always strikes me how contemporary this opera is. It’s over two hundred years old, but politics and human relationships really don’t change that much. I love history—I usually read it in preference to fiction—and seeing Fidelio reminds me of how we’re still working out things that happened back in the French and American Revolutions. I don’t know that I have a favorite moment, but the Prisoners' Chorus in the first act is just thrilling. Marcy Stonikas as Leonore in Fidelio. Stonikas sang the Sunday matinee performance on October 14. Has the experience of being a super changed any of your previous perspectives on opera? Mainly it gave me a greater appreciation for how big and complicated the whole business is. I’ve been involved in a small way with Seattle Gilbert and Sullivan Society productions for nine years, so there wasn’t anything surprising; Fidelio was just enormously larger and more complex. How did you first become interested in opera? I always say that if it weren’t for Gilbert and Sullivan I wouldn’t be here. That’s what got me started on opera. I discovered G&S in a big way in college in Bellingham in the ‘70s, first by reading the libretti. I’m a words person, which is a bit strange in an opera buff. I got all the D'Oyly Carte recordings, then started looking for more opera in English; I found Purcell but not a lot else. I listened to the Texaco opera broadcasts on radio; I enjoyed them, but I wasn’t really able to follow the stories properly. Then I moved to Seattle from Port Angeles, where my family is, in the fall of 1983 to start graduate school at the UW, and I got season tickets to Seattle Opera. This was before captions, so I went to see the opera-in-English series. I have this strange idea than an opera is a play, and there’s not much point in seeing a play if you don’t know what the people are talking about. To me, it’s about drama. If all I wanted was music, I could get more music for my money at the Symphony. For me, opera is theater pushed to the nth degree by this incredible music. Greer Grimsley, in rehearsal for Fidelio, drawn first in pencil and then inked with Faber Castell pens. 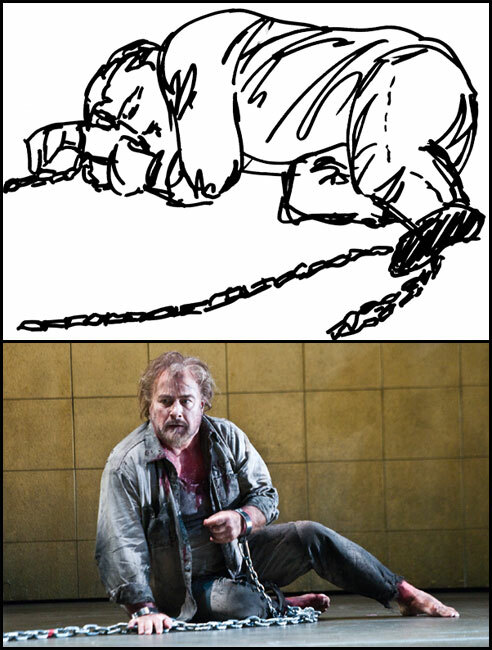 How did you begin sketching opera rehearsals? I’ve been a member of the Seattle G&S Society since the late ‘70s, and attend their shows faithfully every year. After I moved to Seattle I began attending their other functions, and worked as a volunteer in the front of house. At one of their events I was talking to the producer, Mike Storie, and in the course of the conversation he told me it would be all right if I came to rehearsals as a guest. I was rather shy about it, and I brought my sketchbook mainly so I would have an obvious reason for being there, if anyone wondered who I was. It’s also a good way to start conversations. They were doing The Gondoliers that year, and had the orchestra on stage, behind the actors, and used video for the maestro, Bernie Kwiram, and singers to see one another. At the last minute, the person who was going to run the video camera from the house had to cancel, and Mike said, “Well, Jana knows the show.” I took over that job, which meant I didn’t have to give up being involved once the show moved to the theater. Since then my official job with Seattle G&S has been to assist with in-house video. And I keep on doing rehearsal sketches for my own entertainment, and to keep in practice. Clifton Forbis as Florestan in Fidelio. The sketches from life I’ve been doing on and off since I was in high school. I wanted to be an artist, largely inspired by my hobby of comic book collecting, though my talent is actually more for writing than drawing. I took art classes in school, but I didn’t want to live the life of a freelance artist. Since I’m also a map-lover I decided to become a cartographer—making maps is an art, too!—and got my masters in geography, specializing in cartography at the UW, which was one of the three top schools for cartography in the country at the time. I worked making maps for a number of years, but that job disappeared, and I now work as a paper-pusher in the insurance business. It’s a good enough job, but I have to do something to remind myself I’m an artist, so I keep up with the sketches. I don’t consider myself highly talented as an artist; it’s mostly hard work and practice. Drawing is a skill, after all. I took art classes at the Gage Academy back when it was called the Seattle School of Realist Art, and I’ve studied from books, but otherwise I just keep working at it. In the late ‘80s and early ‘90s I did a comic strip called “Pagan Cowboy Joe” in the Neo-pagan magazine Green Egg, but despite my comic book background, I find I’m not particularly good at drawing things directly from my imagination. It’s much easier for me to draw what I see, and that’s what I mostly do these days. 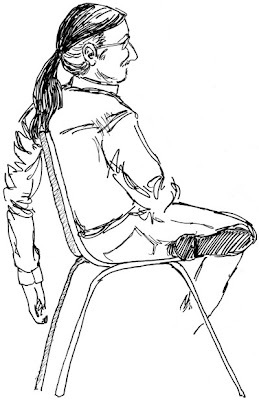 Rehearsal sketches are great because they’re un-posed and spontaneous, but people keep coming back to the same positions and same expressions, so I can continue working on sketches I’ve started but have had to abandon because the person moved. The completely unsuccessful drawings, of course, get torn out of the sketchbook and thrown away. Besides G&S rehearsals, I also take my sketchbook to other places where people are gathered, particularly to meetings of the 36th District Democrats, with whom I am active. I wish the 36th District Republicans had a sketch artist, so we could have a joint show. Faces of the 36th District! 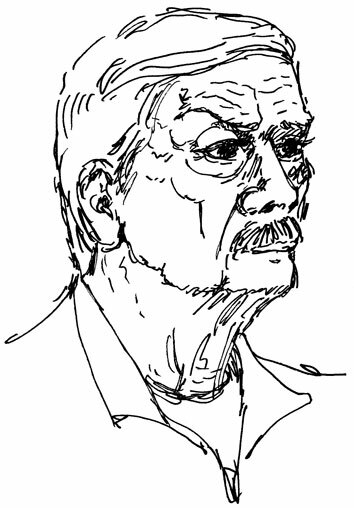 As it is, all my drawings, theatrical and political, just live in my sketchbooks. Supernumerary Patrick Gerrells, who plays Hollingsworth's prisoner husband in Fidelio. "I enjoy my three seconds or so at center-stage with him when I discover him waving the flag," she says. Do you have any favorite productions from your almost 30 years as a Seattle Opera subscriber? It’s hard to pick out individual shows. If I try, I’m sure to forget some of the best—most of them, in fact. After I saw Die Meistersinger, I went around for a week afterward saying to myself, “Damn, that was good!” And I still remember the version of The Barber of Seville which included the slow-motion brawl, and Figaro going around setting the action in motion at the beginning of each act. The Italian Girl in Algiers sticks in my mind, and the recent Fledermaus with the Wagnerian singers. I notice they’re all comedies. I love the tragedies, too, but everyone raves about them. I have a real fondness for comedies, partly because I started out as a G&S fan, but also because they’re less common. When one does show up, and is done well, it’s always a treat. If I could have only one opera recording, it would probably be The Marriage of Figaro, because it’s such a perfectly wonderful comedy. It's not easy to choose a favorite opera after 21 years as a violinist with the Met, but 'Fidelio' has always been on my 'top five' list. Thanks for this fun article! What a wonderful interview! There are so many supers in this production that it's hard to get to know everyone. Jana, you are a gem! As someone who has known Jana some 45+ years it is so wonderful to read about her love of opera and sketching in a great article. Your parents are smiling Jana!